Tala, Paphos - This immaculately presented villa sits high on the hillside of the popular village of Tala, near to St Neophytos Monastery. The tranquil setting of this villa make it a perfect spot to call home. Close by, in Tala there are many local amenities including a traditional village square with a wide variety of restaurants and tavernas. 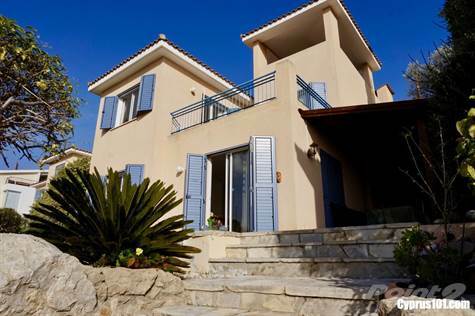 This home is only a 10 minute’s drive from Paphos Town and the International School. For golf lovers, there are two fantastic golf courses nearby in Tsada and another in Aphrodite Hills. There is currently another new one under construction only 5 minutes away. Steps lead down from the car port to the front entrance of the property. On the ground floor is a spacious open plan lounge and dining area with well equipped corner kitchen, bathroom with fitted shower and vanity unit, and a large storage cupboard. Patio windows all around the living area provide lots of light, and lead onto a wide outside terrace with the most fantastic sea and mountain views. Upstairs there are two good size double bedrooms, both with fitted wardrobes and patio doors leading onto a large balcony, again with stunning views of the sea and surrounding countryside. The family bathroom with bath and shower has a large vanity unit with lots of cupboard space. The mature terraced garden is easy to maintain and includes a quiet secluded seating area with views down the valley to the sea. On one side are a selection of fruit trees and there is a very useful outside store room. This property has been well looked after by the current owners and is in excellent condition. It is ideal as a residential home or holiday retreat.